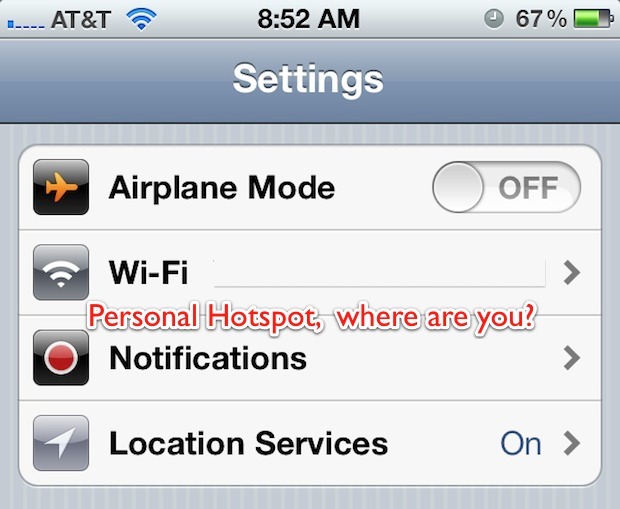 Now tap back to Settings and you should see the familiar Personal Hotspot option. Yes, you will lose your wireless network passwords and custom DNS settings by resetting network preferences, so be sure to note any necessary network settings before doing so. Strangely enough, the same Personal Hotspot disappearance happened with some users who updated to iOS too, so presumably it may even happen in the future with yet another iOS update. Why? It’s probably a bug, but it’s so easy to fix it’s not that big a deal. Tethering is still not working? Another possible fix is to retype the access point name in through Internet Tethering (Personal Hotspot) settings. This can be accessed through Settings > General > Network > Cellular Data, look under “Internet Tethering” for APN, and fill in an access point name. A username and password are not required. Note in iOS 6 and newer, “Network” is now labeled as “Cellular” in settings. Thanks to Gregory, Sayuru, and all of our great commenters for the solutions! Just reset network settings and Personal Hotspot is still missing on my 4s. Are you on iOS 5.1? Try backing up and restoring, see if it shows up, then restore from backup. Not necessary, change the hotspot name and reboot the phone. Of course I am on 5.1, that’s why PH is missing. And I did a restore yesterday as I had just received a replacement for my faulty display. You sure it’s enabled? Updating to iOS 5.1 disabled mine, try turning it back on under network settings. I don’t see it on my iphone4 5.1.1.. i can find it at no where..
thank you mate for that great help..!! Thanks a lot! that was the solution! hi Buddy! thanks alot! it worked!!! I recommend all other Iphone users who have the same problem in this regard, to try this option!!!! you are a champion.! best advise.! try to go settings>general>network and you will see personal hotspot there… activate it and change password. then deactivate it and you will see personal hotspot added on the main settings… I just got it sorted for my iPhone 4s! I had the same problem, when trying to fix it all of the forums advised the same as above look for network. On my phone network was also missing. .
After resetting to factory default I had the same problem so started to checking through all of the settings options and discovered how to turn on the hotspot. General\mobile data then scroll down and voila pesonal hotspot is listed. Select and turn on pessonal hotspot. You may like to try looking for it before resetting the phone to default, it may have been there all of the time just when I couldn’t find it or Network I jumped in and now have the task of restoring everything. I had to change the name of my iPhone and then reboot it for the hotspot to show up again, why the heck that works I don’t even know. what name should i changed to?? I’ve tried all of the above. Still won’t work. Any other tips? Another common reason for this is Onavo. Disabling the service usually brings Personal Hotspot back. Onavo acknowledges this issue on their website. Once I removed Onavo profile..Hot spot was back !! YES! This was it. Thanks for the tip!! Onavo is the culprit! They should advise users before installing! If they know this is an issue, this is scandulous. None of th recommendations have worked. I’ve tried too. I changed the name of my iPhone. PH has worked till I arrived home. But when I used my home wi-fi router the PH missed again. The same issue. None of the recommendations have worked on iOS 5.1. I have an iPhone 4 and after upgrading to iOS 5.1 also experienced the problem of Personal Hotspot setting that disappeared. I tried resetting Network Settings, but what worked for me was the Internet Tethering option. Thank you for the tip. Same here. Even if I go to settings>General>Network> , PH option doesn’t appear. My Iphone4 is locked, when I put the originally sim carrier, it appears again, but locked. When I put gevey sim, vanish! Before I updated to 5.1, I could use with gevey with no problem. Don’t know what else to do! If I reset to originally factory with other sim than the originally carrie, it doesn’t reset. Jailbreak could solve the problem?!! Iphone4 IOS 5.1 (preseved baseband 04.10.01 with redsn0w) unlock with gevey sim/ no jailbreak. did u find the solution?? I tried all suggestions posted but w/o results. any idea? Dear all. Same situation. iPhone 4 now iOS5.1.1 BB04.10.01 and gevey sim first edition. In the Network doesn’t appare Internet tethering setting. The phone works weel except internet tethering! PH will not show as option if no info in Internet tethering…settings>general>network>cellular data. Apn, username and password required for network you are using. Once info inserted, power off iPhone(hold down power off for a few seconds), restart iPhone, and personal hotspot will show in settings. Thank you so much Ahsan. I tried your suggestion and it worked! I was thinking I’d have to jailbreak it to have to use my 4s as a hotspot, but that won’t be necessary anymore. Once again, thanks!!! Same here like Mariana. If I go to settings>General>Network> , PH option doesn’t appear. My Iphone4 is locked, When I put gevey sim, PH vanish! I updated to 5.1. Don’t know what else to do! If I reset to originally factory with other sim than the originally carrie, it doesn’t reset. Could Jailbreak solve the problem? Turn it on, then it should be back on the main settings screen, just worked for me. This is after I tried the Reset Network in the article above. Go back a screen, by clicking on the “Network” button at the top of the screen, then click on “Cellular Data Network” again. Change the APN value to what it was before. And now, voila, the “Personal Hotspot” option is now visible on the General screen ! Hi friends. Please give me an idea to get personal hotspot back to my iPhone 4 iOS 5.1. Please. try to follow “ahsan” steps,,its works on my iphone maybe it will fix your problem…good luck!!! I have no options under Cellular Data. Onlu on/off switch. Neither PH or Tethering showing up in Network Settings. Have double checked to ensure that tethering is authorized on my AT&T account. Update. Even though I had deleted Onavo, the profile remained in my network settings. Deleted the profile and I’m finally back! I just found out that choosing a tethering APN (Settings \ General \ Network \ Cellular Data Network) and disabling any wifi connection makes the PH available in the network settings. Starting from the top I tried most of these fixes with no luck until I saw the post regarding Onavo. I removed it and bingo up she came. No reboot or anything, just appeared. Thanks! Need help.. I still miss personal hotspot, after reset its appear, but if im going turn on its dispear again.. Can anyone help me..
Go to Settings, General, Network, then, Set the Enable 3G on and the Cellular Data on. You will notice that the personal hotspot will appear under Data Roaming. Oh, finally! Thank you so much! still no luck , any suggestions please. I solved the problem on my iPhone4 IOS 5.1.1, by entering “Internet” as APN under menu: Settings – General -> Network -> Cellular Data Network -> Internet tethering. After that the Personal Hotspot menu appeared. I got my new ipad, but i couldnt get internet tethering to work. I entered the APN, username and password for my mobile carrier, and if i exit from that screen and go back again to it, those info details for tethering vanishes…what should i do . Help, please. Hi dont include ‘ on the ipad name under general > about > name and on the personal hotspot. That works. I just got my iPad 3 and I can’t see the personal hotspot neither the tethering menu. Only what is under cellular data network are VPN &WIFI. Pls help. I’m using telkomsel as my carrier. This is what worked for me.. go to..
Internet Tethering APN – instert the same name as the Cellular Data APN just above. With this you should have the personal hotspot option in network. Nice it worked with me.I just typed the same as my cellular Data APN above then just deleted it back and it came!! nice. thanks to all the people here in this forum who shared thier ideas..cheerrrsssss!!!! I started following the instructions to reset network settings. BUT when I did settings – general – network settings, I saw a menu option “enable personal hotspot” just below “data roaming”. I enabled personal hotspot from there and presto, it was enabled AND the menu option “personal hotspot” reappeared in its usual third place position in the main “settings” menu, after “airplane mode” and “wifi”. So I did not need to reset network settings. I tried all of the tricks, but… i see PH, but i can share my internet only over the bluetooth or USB. Stone Age !!! WTF ? For me, too, it was onavo. Just removing the application didn’t do it. I had to remove the profile. To be fair, I had a second profile from another application, and I removed that, too. I then went back to general/network, and PH showed up. Didn’t even have to reboot the phone. I can’t fill the APN, user name and password under Internet Tethering. I tried fill it a lot but it don’t save the username and password. How can I do? Setting –> General –> Network –> Cellular Data Network and made me scroll down to Internet Tethering, made me enter internet there. Thanks for the much help though. Hope those who aren’t getting the personal hotspot due to carrier limitation can get this to work. I tried all the options given above but still no luck. mine is phone4, with IOS 5.1.1. I have tried all the options given above but still no luck. mine is phone4s, with IOS 5.1.1. – Setting – General – Network – Internet Sharing – ….than change whatever you need and it works…. When I go to settings>general>network there is no option there to click on for cellular data, there is only on on/off slider? I have tried to reset the network setting with no luck. Can you tell me how to get the Cellular Data to let me go in to it and change the information? I bought a new iPad…….but there is no personal hotspot in it..”….I restore the setting…..but still ph is missing…..what to do now…???? I have the 4s and switched to h20 wireless. When I started I had all the options to cgange the apn for internet and sms,mms. Now I have nothing. I don’t even have the hotspot listed. Also, there is no settings under cellular data…just on or off. I tried resetting the network settings reinstalling again. Re jailbreaking and nothing. Any other options other than throwing this brick into the ocean? Thanks in advance. for my case, after restored to factory setting, tethering and hotspot are there but its gone after i restored from my backup. i believe you may facing the same problem. sync back those backup info from itunes instead of restore from backup. I have the iPhone 5 iOS 6 and my (PH) is not one the screen I tried resetting network but it didn’t work how do I fix this? Your Personal Hotspot will be where it belongs! Followed the reset network settings on iPhones, both now allow iPads to connect. I’m not sure if anyone else had this happen, but sometime after my IOS6 update (a week later, to be precise) my Hotspot option disappeared. I found that it now resides in under General/Cellular. I don’t like the extra steps but I did find it. Hi 2 everybody!Same problem of loosing personal hotsport option on my iphone 4,as i tried all ways that mentioned above br still failed..rly need ur help Friends!! I wanted to share my experience here in case my troubleshooting tips may help someone else. Earlier today I upgraded my data plan with Verizon, in order to become eligible for employer discount on the data feature as well as the mobile hotspot feature. Aftering receiving the confirmation email, I went to my settings but hotspot was still not there. I checked under Settings->General->Cellular and found the Set Up Personal Hotspot button. However, it prompted me to contact Verizon to add the feature. I tried resetting network settings, and I was sure that would work but it did not. I was worried I would have to call Verizon and I didn’t want to have to deal with that. So just for kicks, I turned off my cellular data and turned it back on. (Settings->General->Cellular->Cellular Data) That little toggle off and back on did the trick! The Set Up Personal Hotspot button immediately turned into an on/off menu, and when I went back to the general settings menu, hotspot was listed. Success! Moral of the story… reset network settings doesn’t reset everything you think it should. Sometimes toggling a setting off and back on will get the result you need. I hve tried all of the above but still not working. This was really helpful, thanks a Million. Really works……!!! Thanks a lot for posting it…!! Thanks, this worked. After resetting the Network settings, I had to go to General, Cellular, and switch on Personal Hotspot option on iPhone 4 to see it under General Menu. I fixed mine but dont know how i did it. I tried the reset network settings and nothing. The change the phone name to Jack and nothing happened so changed it back to Iphone and hotspot came back?? who knows what the hell is going on. I have a I phone 4s and the hotspot went missing after the upgrade 5. The other problem with the upgrade is that the maps in remote towns are incorrect. I still can’t see the personal hotspot. Why??? Hey, I reset my network settings and I still do not have the personal hotspot…. How do I get it???? Is their another way????? Thank you and this still works with iOS 6.0 as well. Thank you, the second “alternative” solution worked great for me. And i hadnt updated my ios,.. my hotspot just decided to disappear from my settings screen. THANK YOU! ATT was useless! i’ve done all the steps that hes said above but still the PH option hasn’t appeared someone HELP please? my personal hotspoit is missing after updating ios 5.1.1. Disable Onavo and it worked for me. Thanks! It worked!! I jus had to Keyin the access point name in the tethering settings..thanks guys!! I know my current provider doesn’t offer PH but I want to move to a new provider who does and want to be sure this option to enable a PH will reappear when I change to the new provider. Can anyone offer advice please? Why is there still no PH option on my iPhone. I updated to iOS 8.1.1 and guess what there is no personal hotspot and cellular data option in setting! Kindly tell me how to fix it? i tried all this but i still can’t find my hotspot on my iOS 8.2. Guys help me pls!!! Managed to connect via WiFi my iPhone 5 with my MacBookPro which shows PH connected in the WiFi menu, but…..I can’t do anything online. No emails, no Internet, no Dropbox connection, nothing. My iPhone confirms 1 PH connection.